For the characterization and measurement of primary particles, the particles should be well dispersed as agglomerates falsify the measurement results. Ultrasound is a reliable tool to destroy agglomerates and to create conditions where the primary particles are hold in adequate distance to each other so that they can be detected as individual particles. 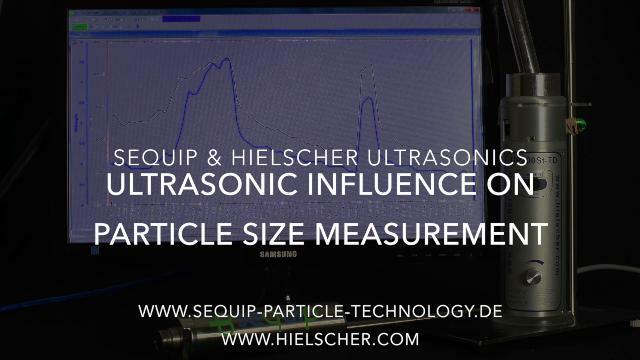 The following study of Sequip presents the successful combination of Hielscher’s ultrasonic devices with Sequip’s PAT sensors for a reliable particle characterization. Consequently, the process is influenced by many variables, which interferes with a reliable evaluation. Sequip’s PAT sensors are developed for the direct measurement of particles so that changes in particle size distribution are consistently recorded and safely evaluated. The in-situ PAT measurement equipment allows to gain additional information during the development of new formulations concerning the overall morphology as well as to control product quality during processing. The measurement can be performed in-situ in the laboratory or inline and in real time during the process providing exact measurement results depending on the product characteristics and the dynamic size range. Agglomerates falsify the results of particle characterization. For reliable measurements, the process of agglomeration must be prevented. The simplest way would be the addition of a dispersant/ dispersing additive. However, the use of a dispersant changes the original formulation of the product and consequently the results of the measurement would not reflect the real size distribution. For the process control during production, the use of dispersing additives is therefore an inappropriate method. The diagram below depicts PVC800, a poly vinyl chloride, with a particle size distribution of max. 500-630μm. However, due to agglomeration the measurement results show peaks of 1400μm. Fig. 1 shows the measurement of PVC 800: PVC 800 shows normally a particle size distribution with peaks at approx. 500-630μm. Here, however, peaks of up to 1400μm are measured due to agglomeration. A process-independent alternative is the installation of an ultrasonic disperser. To demonstrate the positive influence of ultrasonic dispersing, the PVC800 suspension was deagglomerated by sonication. 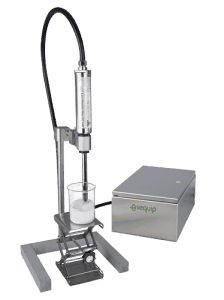 A glass beaker with the PVC800 formulation was sonicated with the ultrasonic disperser UP200S whilst the particles were characterized in-situ with Sequip’s PAT sensor. Fig. 2: The diagram shows clearly that the measurement of PVC 800 particles with ultrasound (green) has a smaller and more regular particle size distribution than the measurement results obtained without ultrasound (red). It has been shown that ultrasonication is an adequate and reliable tool for de-agglomeration and particle breakage. 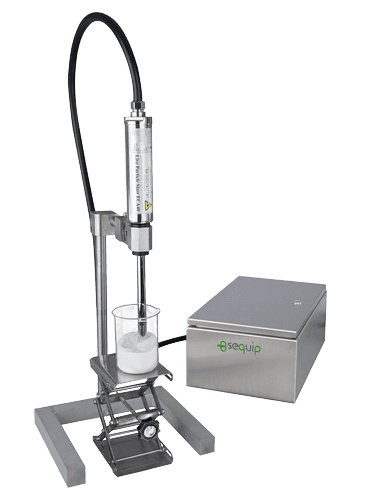 Ultrasonic dispersing can be implemented flexibly at any stage of production and ensures a reliable measurement and evaluation of particle size with Sequip’s PAT sensor system. Click here to visit Sequip’s homepage and learn more about their PAT sensors for particle measurement! Ultrasonic tissue homogenizers are often referred to as probe sonicator/ sonificator, sonic lyser, ultrasound disruptor, ultrasonic grinder, sono-ruptor, sonifier, sonic dismembrator, cell disrupter, ultrasonic disperser or dissolver. The different terms result from the various applications that can be fulfilled by sonication.